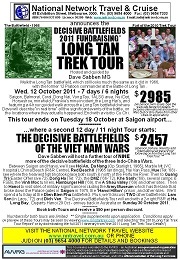 The 2011 Long Tan Trek Tour and the 2011 Decisive Battlefields of Vietnam Tour are now finalised. Please see below a downloadable FLYER and ITINERARY for both Tours. depart VN Sat 29 Oct from the DBV Tour (arrive Aust 30th am). We have retained very much the same formula as it has drawn so much good comment, and much the same visits and timings..
We've listened to those who did the first week only in 2010 and either wanted to see the VC tunnels or wanted some extra time in HCMC (Saigon). We've added a day after returning from Vung Tau. Now, those who want to go to Cu Chi can go (and fire some weapons - AK47, Armalite, M60, etc if they want to, at about US$1.50 a round!) and those who want an extra day in Saigon have that option too. Sure, it adds a night at the Majestic Hotel, but that's hardly a burden. I'm sure some will just want to hang out on the 5th or 8th floor bistro/bars and watch the road and river traffic go by. <--- Download the 2011 flyer (1 A4 page). We've listened again - we went to Da Nang in 2010 but didn't go the extra 30 Km to Hoi An. While not a battlefield, Hoi An is such an attraction that we've been asked to spend a day there. So now it's our first day - a break after the first week viewing the Aussie areas of operations and before we get into the American areas of operations. Two nights and a day have been added, and we're wondering if even this will be enough. But the rest of the DBV Tour very much follows the well-received format of the 2010 Tour. And, yes, we've retained the R&R at Ha Long Bay - again, not a battlefield, but certainly a welcome recuperation after an intensive week of viewing Hue, the DMZ and points North. (17 A4 pages, as at 25 Nov 2010). 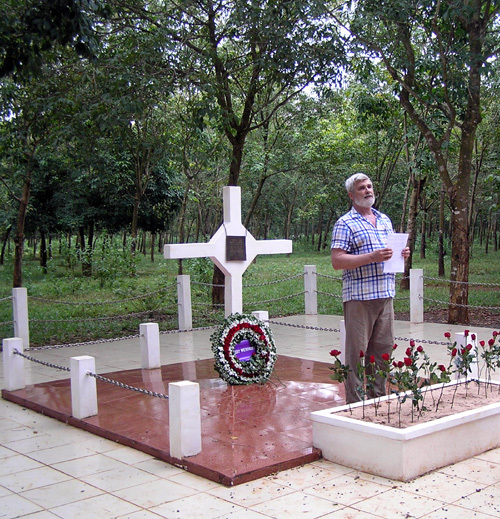 The Report is a statement of what the Tours did, supported by photographs taken and contributed by those on the Tours. Read what the folks on the Tours thought and said about it. And then at the end there's a few "out-take" pictures you might find amusing - they did. And as you will see from the Tour comments - there's lots to keep the ladies interested - as well as Saigon and Hanoi, there's Ha Long Bay and now Hoi An. And I might add that they all wanted to see the battlefields as much as the men did. So - please pass the flyer on, pin it up at the office or in the club, add it into your newsletter, bring a mate, form a group, if there's enough of you interested, we'll make a group only for you for a date you all agree on. Thanks for your interest in visiting this page. I'd be only too happy to go with you to visit the Decisive Battlefields of the Three Indo-China Wars.